AzhwAr says that emperumAn, who has taken residence in the divine abodes mentioned in the previous pAsuram, removes the enemies of followers and is very simple. The divine abodes mentioned in the previous pAsuram still remain in his heart and continue. ivai avan kOyil– the divine abodes mentioned in the previous pAsuram are his places of dwelling. 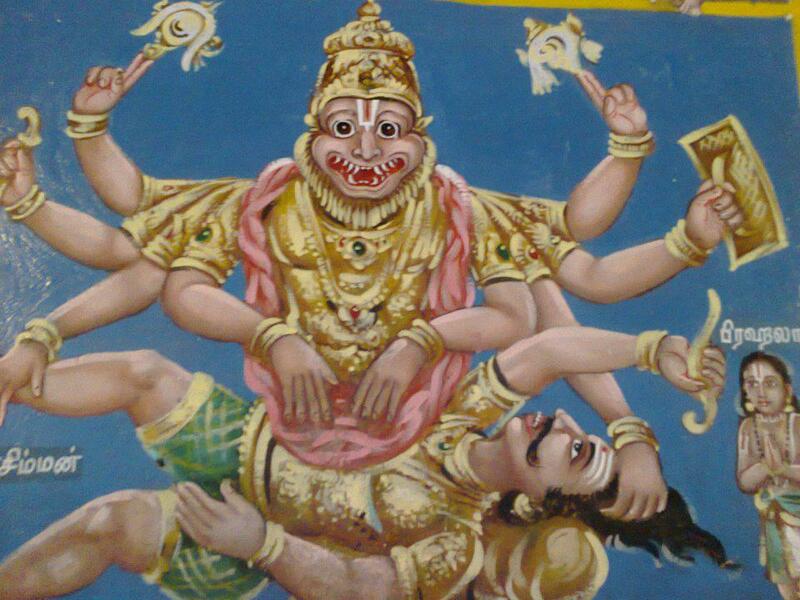 avai seydhu ari uruvum AnAn – Just as mentioned in SrI rAmAyaNam yudhdha kANdam 94-82 “chinnam bhinnam” (cut and split), emperumAn took the form of narasimha to split iraNiyan’s heart into many parts. Agam avai seydhu – splitting the chest. He split one into two. AzhwAr says that the purpose of emperumAn taking residence in many different abodes is to destroy enemies [of his followers]. sevi theriyA nAgaththAn – emperumAn has his mattress thiruvananthAzhwAn (AdhiSEshan) who carries out the activities of his ears through his eyes. Aren’t snakes referred to as “chakshu: Srava:” (in thamizh, katsevi, having eyes as ears)! Has it not been mercifully mentioned in thiruvAimozhi 9-9-9 “thUdhu sey kaNgaL koNdonRu pEsi” (speak with the help of eyes and carry out a message) by which the function of one sensory organ has been appropriated by another! nAl vEdhaththuLLAn – emperumAn has been identified by the four vEdhas. naRavERRAn pAgaththAn – naRavu refers to the lowly arrack. emperumAn has the characteristic of giving a portion of his divine form to accommodate Sivan who carries lowly arrack in his hand. This refers to his quality of Seelam (simplicity). naRavu could also be considered as referring to sweetness [like honey]. Thus this will refer to Sivan taking gangA on his head, and emperumAn giving place to such Sivan on his divine form. ERRAn would refer to one who has ERu (bull) as his vehicle and combined with naRavu this will refer to Sivan who has bull as his vehicle. Who has such a person as a part of his divine form? pARkadaluLAn – one who is reclining in thiruppARkadal (milky ocean). We will take up the 32nd pAsuram next. This entry was posted in iyaRpA, mUnRAm thiruvandhAdhi on March 29, 2018 by T N Krishnan.